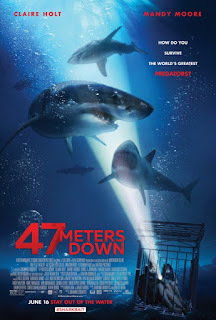 Leave it to armrest-clencher “47 Meters Down,” which received a late theatrical distribution by the hilariously named Entertainment Studios instead of going straight to VOD as originally planned, to be one of the more satisfying summer releases that holds up its end of the bargain. In the minimalist vein of 2004’s “Open Water” and 2016’s “The Shallows”—just far, far below the surface this time—this skillfully lean and mean isolation thriller that proves all you really need sometimes are a few characters and a few great white sharks. 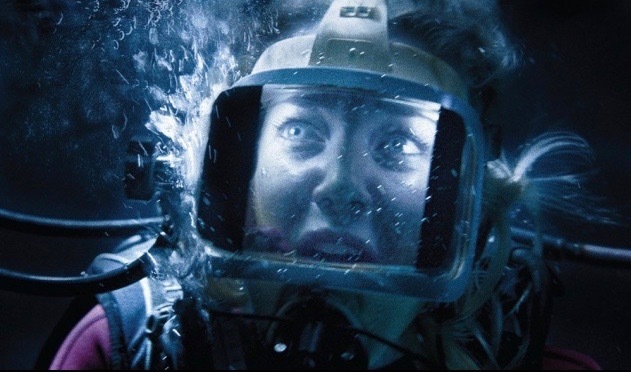 Director Johannes Roberts (2016’s “The Other Side of the Door”) must be made of confidence, enough to get his film’s title on the screen to read, “Johannes Roberts’ ’47 Meters Down,’” but for the most part, he earns his clout, milking no-nonsense, hand-wringing tension out of a trapped scenario for all it's worth. The high-concept premise actually isn’t patently ridiculous, nor does it struggle to fill a compact 89-minute running time in the execution, either. Direct and harrowing, “47 Meters Down” does what it does pretty effectively, jangling an audience’s nerves and making them squeal. Vacationing in Mexico with younger and more spontaneous sister Kate (Claire Holt), Lisa (Mandy Moore) remains vulnerable after being dumped by her longtime boyfriend. When the two women meet a couple of charming local guys (Yani Gellman, Santiago Segura), Kate talks Lisa into going with them on a boat and cage diving with sharks. 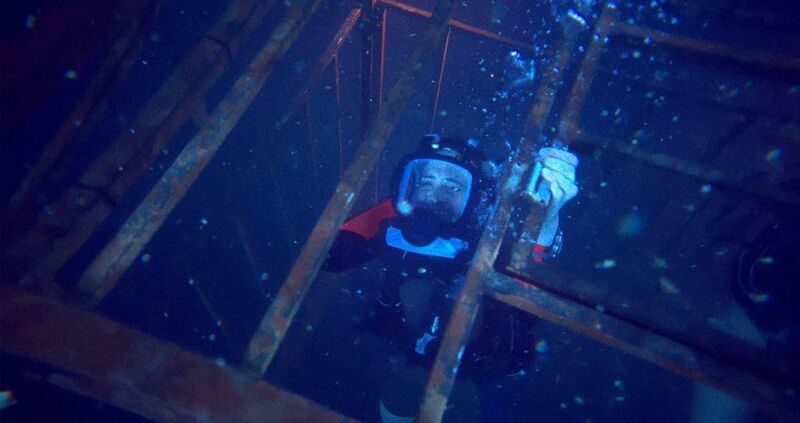 Based on the rickety cage and her inexperience with scuba diving, Lisa is a little hesitant at first, until the boat’s captain Taylor (Matthew Modine) reassures her and she feels safe once she’s in the cage, even as buckets of chum attract 20-foot great white sharks. The sisters enjoy the ocean sights for a short time in the shallows, but then the winch of the cage snaps and they drop 47 meters to the ocean floor. Once Lisa and Kate regain consciousness, they have to remain calm, but they don’t have much time. Their air supply is running low. They’re out of range from reaching anyone above with their radio communication within their scuba masks. Oh, and those vicious creatures of the deep are lurking somewhere in the dark abyss. Are the sisters SOL? The opening credits sequence of “47 Meters Down” is the first time director Johannes Roberts really toys with audience expectations by shooting in the ocean from what appears to be a shark’s point-of-view eyeing someone on a raft. The rest of the film lives or dies on whether we care about its two characters making it to the surface with all four limbs still attached, and until it’s ready to pounce, the first half does an efficient job of setting up Lisa and Kate. Lisa, who wants to prove to her ex that she can be fun and adventurous, avoids all the proverbial canaries in the coal mine and agrees to get in the cage, while Kate is more open to taking risks and has experience scuba diving. The salt-and-peppered Captain Taylor chooses some amusingly poor words with, “Once you’re down there, you’re not going to want to come back up.” Roberts then wastes no time putting Lisa and Kate in danger and makes sure there's little downtime thereafter for apologies and regrets. The threat level remains high, and then the film keeps upping the ante and keeps audiences on pins and needles throughout with the help of a jitter-inducing score by tomandandy, only to end in a way that pleasingly goes against the grain. Without cluttering the structure with any extraneous subplots, writer-director Johannes Roberts and cinematographer Mark Silk never pull the focus off Lisa and Kate. There are no human villains here, not even third-biller Matthew Modine, just the dangers of mother nature and the lack of oxygen in the deep blue sea. Only so many story beats can happen with two characters trapped underwater, but Roberts and co-writer Ernest Riera come up with enough practical reasons for the two young women to keep leaving the cage. They can’t just stay put and wait for help to arrive because their oxygen tanks are dwindling and their radio communication with the boat captain is only within range if they swim closer to the surface; if they venture above the bottom of the ocean, they risk rubbing up against the sharks, and if they swim up to the surface too quickly without being attacked, they could die from nitrogen narcosis or the bends. As the human chum with names, Mandy Moore and Claire Holt (TV’s “The Originals”) are solid, deserving credit for hyperventilating and acting inside scuba masks and spending so much consecutive time underwater. If it’s three-dimensional writing you seek in your sharkexploitation pic, don’t hold your breath. The script has its share of clunky, overly matter-of-fact dialogue, which isn’t the stuff of Aaron Sorkin, David Mamet, or even Roland Emmerich on a good day, however, it probably sounds as close to what any person would say if caught in the same dangerous predicament. The characters tell the audience a lot, like when the girls say, “I’m so scared,” or “The shark almost got me,” even if their feelings and close calls speak for themselves. 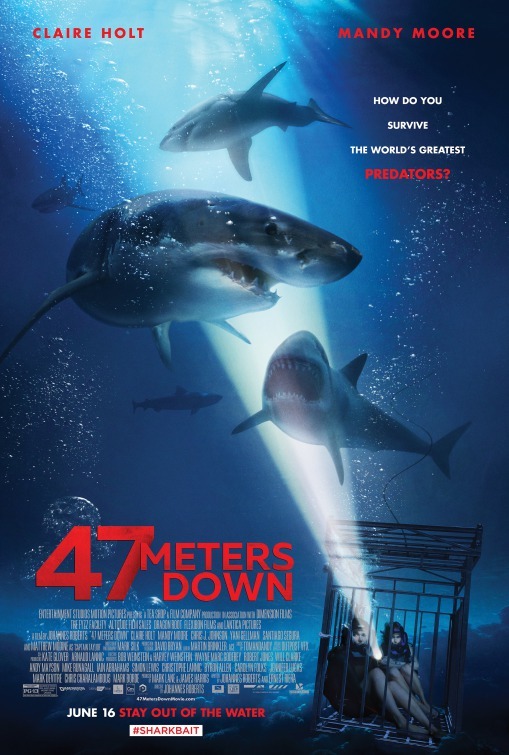 Where it counts, “47 Meters Down” delivers legitimately hairy thrills, a palpable sense of underwater claustrophobia and asphyxiation, and a couple of well-timed jump scares. 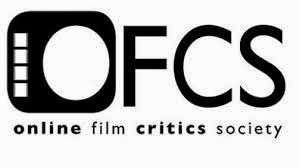 On those grounds, it’s recommendable for doing exactly what it sets out to do. If swimming in the ocean with sharks didn’t already prove to be a bad idea, it is now completely out of the question.